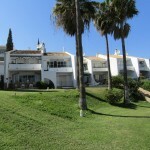 Calahonda is East of Marbella and almost central between Marbella and Fuengirola. Easy access via the motorway enables travel to anywhere on the Costa del Sol. Malaga s international airport is 25 minutes away and Marbella s large shopping centre can be reached in just 15 minutes. The region stretches gently from the coast up to the undulating hills 300 metres above sea level, offering fantastic views of the surrounding countryside running down to the sea, and along the coastline to Gibraltar and Africa ; the African Mountains and African coastline are often clearly visible. Sitio de Calahonda is the largest property development you will find between Marbella and Fuengirola. In fact, this neighbourhood has grown so successfully that it could qualify as a town. However, residents have been unsuccessful in their attempts to separate it from Mijas, the municipality to which it belongs - and to which they must pay taxes. Rural flavour and coastal lifestyle are two of Calahonda's most attractive features, because, although the area is developed, its founder was keen on green areas, large plots and limits on apartment buildings. Thus, the area has grown in a generally peaceful and rustic fashion. While the vast majority of Calahonda's 600,000 square metres is devoted to villas, townhouses and space for four golf courses, selected areas have been dedicated to providing residents with every amenity imaginable. There are, therefore, three commercial centres which house most of the development's 50 restaurants, cafeterias and pubs as well as seven banks, several supermarkets and a wide variety of other businesses including: hardware, furniture, garden supply, travel agencies, car hire, car repair, property management and much more. Health care needs are provided for by a chemist and three medical centres, offering 24 hour service. Furthermore, the state-funded Hospital Costa del Sol is well known as the Coast's state-of-the-art medical facility and is just minutes from Calahonda. Sports are easily incorporated into a Calahonda lifestyle. For starters, there are a total of 10 golf courses within a 10 kilometre radius of this urbanisation, which also has its own port, Cabopino. Calahonda is a great location to find a decent bar if you're staying in the area and don't want to travel too far out of your way. Like all services in Calahonda the majority of the action takes place in the multi-storey commercial centre, El Zoco where Key Estates are based. Calahonda, surrounded by 27 kilometres of coastline and 24 different beaches to choose from, has something for everyone. Whether you're into jet-ski-ing, sailing, star-spotting, balloon flights, cable ski-ing or simply enjoying some of the best fresh seafood in the world you'll find it all at Calahonda and Marbella's seafront and watersports centres. For the unitiated, a great way to learn the basics of water ski-ing is at the Cable Ski centre based at Parque de las Medranas in San Pedro de Alcantara to the west of Marbella. Calahonda has everything from oriental cuisine, international food to the exotic tastes of Southern Spain. Typical dishes are seafood, particularly the "el pescaito frito" famous in this area. Enjoying and experimenting with Andalucian cuisine is a fundamental part of your stay in the Costa del Sol. What better than an alfresco lunch commencing with a chilled summer gazpacho soup. Freshly harvested Mediterranean fish and a salad dressed with the finest Olive Oil. Here are a few restaurants in the Calahonda area to get your taste buds watering.